It is a fact that the majority of individuals experienced the foot pain one way or another. This is so because; such individuals don’t give proper attention to their feet. Now such difficult looking problem can be minimized by the use of the Massage Slippers. The Telebrands innovative Massage Slipper is basically designed by the amalgamation of the ancient science of acupressure to new level modern technology. The slippers use Reflexology technology to heal or improve the functions of the body by putting a certain amount of pressure under the feet zones. Each zone of the feet corresponds to a specific body function. The Massage Slippers are equally beneficial for the individuals suffered for the diabetic patients. The Telebrands shoes help to perfectly balance the pelvis and hips that are essential for the well being of the upper and lower body parts. The specially designed Therapeutic Shoes are not only beneficial for the feet, but for the general well-being as well. When the muscle of the back and neck tenses up, then it puts a negative impact on the natural body posture. This changed body posture will also add more pressure to the feet and hip as well. 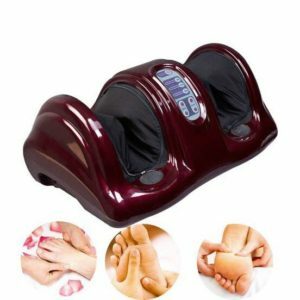 By wearing the Foot Massager, you can minimize the level of tension and strain caused by the improper body posture. These foot zones help to stimulate the beneficial body chemicals and other good enzymes that promote the general well being of an individual. A lot of Reflexologists are of the view that this method is equally beneficial to treat other types of illness. Usually, the reflexology massage will begin to work one hour just after the first use. The best thing about the Massage Slipper is that all the advantages or results of this slipper are 100% permanent. You will certainly feel the difference after using the sleeper. These massage slippers can help to get rid of your problem by concentrating the particular bodily disorders. Reflexology releases the pressure of the strained feet by providing adequate support and balance to the body. By using the right type of massage slippers, an individual can feel the renewed energy throughout the body. The massaging slippers provided by the Telebrands Pakistan, are also recommended by the health care professional. If any medical doctor prescribes you the massaging slipper, then you should not compromise on quality just because of saving couple of hundred rupees. The quality of the high-end massage slipper is that it will also increase the flow of blood in the body. This is the reason that you should always try to buy the highest quality massaging slippers. The Therapeutic Massaging Slippers are must have accessory for any individual who often complains about their feet. The Massaging Slipper will help you to maintain your natural body posture, revitalize your body and it will also help to save the body from certain chronic disorders that could occur lately in your life. The Massaging Slippers can be bought exclusively from the official Website of Telebrands Pakistan. All the customers can also use the number 0333-4115583 for the same purpose. What you will get with the Massage Sippers? Note: Additional delivery charges of Rs.200 would be applied in the order.